...well, briefly in the saddle, atleast. This didn't exactly feel like a great experiment in creative expression, but it's a start. I made this bag this weekend for a friends' birthday. 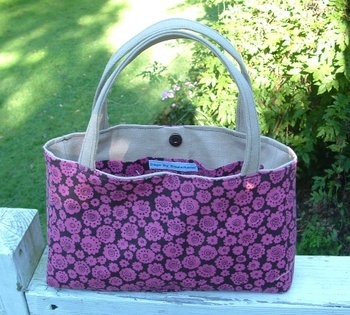 It's the Amy Butler In Town Bag pattern, with a few minor tweaks. I added interfacing (why doesn't she call for that? 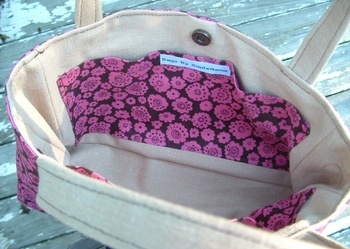 ), a magnetic snap for closure, and changed the inside pockets a bit too. I love this fabric that I was surprised to find at JoAnn's. I wish I had added some more fun embellishments--ribbon or button on the outside, etc....but I was getting sleepy. And the inside, with my personalized tags that I can't for the life of me remember where I bought them. Gene Autry will now be in my head all day long.